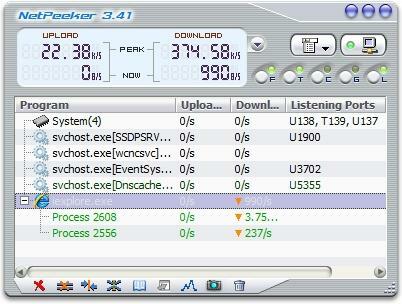 Developed By : eMing Software Inc.
NetPeeker is a network monitor and control tool for personal Internet user. By revealing all applications accessing network and their connections showing speed in real time you can find more hidden information about your network. The build-in personal firewall protect you from hackers attack from outside.You can find those Spyware or Trojan and block them.You can kill connections you dont want without shutdown the application. You can trace back to the source to find who is the guy and report abuse. You can setup speed throttle to limit network bandwidth usage for every application and every connection and also can guarantee bandwidth for critical applications.Build-in System Guard to monitor registry change and application executions and prevent malware from running.